Is Altaba Inc. (NASDAQ:AABA) a good bet right now? We like to analyze hedge fund sentiment before doing days of in-depth research. We do so because hedge funds and other elite investors have numerous Ivy league graduates, expert network advisers, and supply chain tipsters working or consulting for them. There is not a shortage of news stories covering failed hedge fund investments and it is a fact that hedge funds’ picks don’t beat the market 100% of the time, but their consensus picks have historically done very well and have outperformed the market after adjusting for risk. Altaba Inc. (NASDAQ:AABA) investors should pay attention to a decrease in activity from the world’s largest hedge funds lately. AABA was in 87 hedge funds’ portfolios at the end of the third quarter of 2018. There were 95 hedge funds in our database with AABA positions at the end of the previous quarter. Altaba was the 15th most popular stock among hedge funds at the end of September (see the list of 30 most popular stocks among hedge funds). To most investors, hedge funds are perceived as worthless, old financial vehicles of yesteryear. While there are greater than 8000 funds with their doors open at the moment, Our experts choose to focus on the elite of this club, about 700 funds. These money managers command most of the hedge fund industry’s total asset base, and by shadowing their top investments, Insider Monkey has brought to light various investment strategies that have historically exceeded the market. Insider Monkey’s flagship hedge fund strategy outpaced the S&P 500 index by 6 percentage points per annum since its inception in May 2014 through early November 2018. We were able to generate large returns even by identifying short candidates. Our portfolio of short stocks lost 26.1% since February 2017 even though the market was up nearly 19% during the same period. We just shared a list of 11 short targets in our latest quarterly update. We’re going to analyze the recent hedge fund action surrounding Altaba Inc. (NASDAQ:AABA). Heading into the fourth quarter of 2018, a total of 87 of the hedge funds tracked by Insider Monkey were bullish on this stock, a change of -8% from the second quarter of 2018. 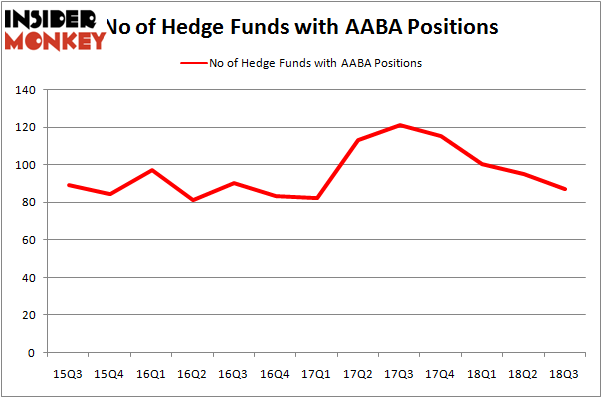 The graph below displays the number of hedge funds with bullish position in AABA over the last 13 quarters. As you can see Altaba’s popularity has been declining for the last 12 months. So, let’s review which hedge funds were among the top holders of the stock and which hedge funds were making big moves. More specifically, Elliott Management was the largest shareholder of Altaba Inc. (NASDAQ:AABA), with a stake worth $1706.9 million reported as of the end of September. 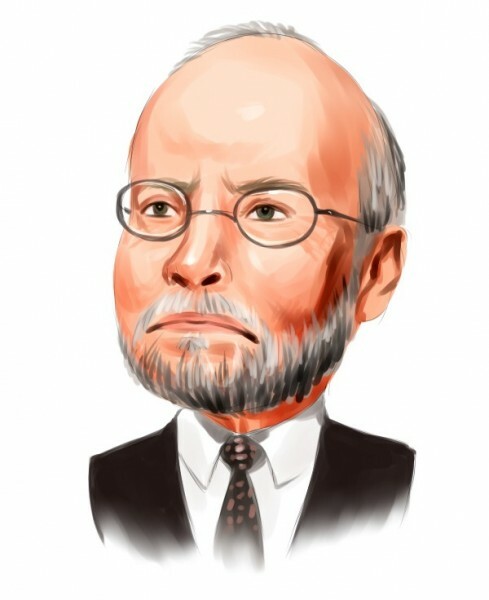 Trailing Elliott Management was Farallon Capital, which amassed a stake valued at $1446.7 million. Owl Creek Asset Management, HBK Investments, and Element Capital Management were also very fond of the stock, giving the stock large weights in their portfolios. Due to the fact that Altaba Inc. (NASDAQ:AABA) has faced declining sentiment from the aggregate hedge fund industry, we can see that there is a sect of money managers who were dropping their positions entirely in the third quarter. Interestingly, Matthew Halbower’s Pentwater Capital Management sold off the biggest stake of the 700 funds tracked by Insider Monkey, worth about $969.5 million in stock. Derek C. Schrier’s fund, Indaba Capital Management, also sold off its stock, about $123 million worth. These moves are intriguing to say the least, as total hedge fund interest was cut by 8 funds in the third quarter. Let’s now review hedge fund activity in other stocks similar to Altaba Inc. (NASDAQ:AABA). These stocks are Baxter International Inc. (NYSE:BAX), Telefonica S.A. (NYSE:TEF), HP Inc. (NYSE:HPQ), and Square, Inc. (NYSE:SQ). This group of stocks’ market caps resemble AABA’s market cap. As you can see these stocks had an average of 26.5 hedge funds with bullish positions and the average amount invested in these stocks was $1.7 billion. That figure was $16.3 billion in AABA’s case. Baxter International Inc. (NYSE:BAX) is the most popular stock in this table. On the other hand Telefonica S.A. (NYSE:TEF) is the least popular one with only 5 bullish hedge fund positions. Compared to these stocks Altaba Inc. (NASDAQ:AABA) is more popular among hedge funds. Considering that hedge funds are fond of this stock in relation to its market cap peers, it may be a good idea to analyze it in detail and potentially include it in your portfolio. Honeywell International Inc. (NYSE:HON): Are Hedge Funds Right About This Stock... Here is What Hedge Funds Think About Kennedy-Wilson Holdings Inc (NYSE:KW) Is Sony Corporation (NYSE:SNE) Going to Burn These Hedge Funds? Molson Coors Brewing Company (NYSE:TAP): Are Hedge Funds Right About This Stock... Is Oracle Corporation (NASDAQ:ORCL) A Good Stock To Buy? Is Newmont Mining Corp (NYSE:NEM) A Good Stock To Buy?